At some point or another, we all move away: to a new house, a new city, or if you’re like me, a new country. And while this transition may be more common for students who move away for their education, lots of adults find themselves in the middle of this scenario too. When we uproot ourselves from our home, we face a whole new collection of challenges. Your social structure is mostly non-existent, your everyday routine has been tossed in the air, and simple questions like, “How do I get to the nearest Target?” can send you into a spiral of Google searches and awkward conversation starters. We have to find our footing at our new place of employment (or find employment) and must learn to navigate a whole new culture. And to be honest, it’s difficult to establish yourself when no one knows you and you know nothing about them. If this is you, then I’m right there too. 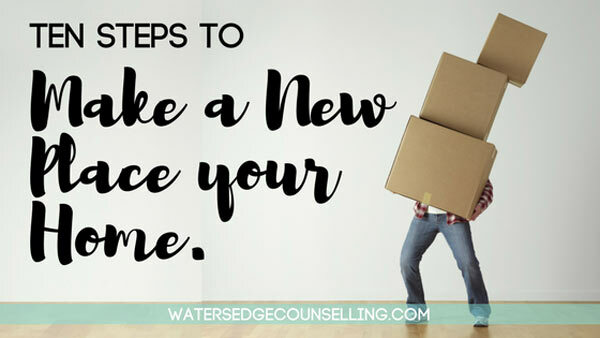 The transition to a new home isn’t easy, but it is do-able. Here are ten steps I’m following while I try to make myself a home in a new city. Before you make the move, identify a community you can build a life around. It could be new housemates, new work mates, a parents group, a church, a book club or a gym. This will centralise you and give you something to work towards straight away. It’s likely that a friend, colleague or loved one knows someone in your new city, or at least knows someone who has been there. Ask your mutual friend to connect you over Facebook or text, and see if you can meet up for coffee or go for a walk. In a perfect world, this would lead to a great friendship, but even if you don’t ‘click’, they’ll be able to give you great advice on how to set up your life there. The first few months in a new place are rough, purely because everything is so different. If you need help moving, finding a job, getting transport or finding directions, don’t be afraid to ask for help. Ask your new community (from step 1), a mutual friend (step 2), or even the city tourism office. If all else fails, talk to your family and friends back home. Take an afternoon to wander around your new neighbourhood and meet the people there. Find the local convenience store, the best coffee shop, and see what people do for fun. Once you’re settled in this, branch out and take public transport or drive downtown and to other suburbs locals suggest. Make this your city. Transition isn’t easy. There are some days you will feel accomplished, like you’re fitting in and the move was the best decision you ever made. Other days you will question why you came here and how you can keep going. It’s okay. In the moments when the negatives seem to outside the positives, take a breath and talk to someone from home. Give yourself permission to break routine and recharge, and then keep going. You have to think outside the box when you’re on your own. The ways and means you normally would have achieved things won’t always work here. So if you’re sick, lost or lack transport, get creative. Think about the ways other people handle these situations, and instead of calling home (which is now hundreds of miles away), look online. I once had medicine and lunch delivered to me through an app because I couldn’t get out of bed. No matter how you’re feeling or what self doubt comes your way, you’ve got this. You were strong enough to make this transition, and you can complete it. So be kind and gracious with yourself, and celebrate the wins. Every new day is a victory, as is every new social encounter, journey through the city and dinner invitation. Often the places we move to are completely foreign to us. The way things look, sound and smell are completely different to what we are familiar with, and it takes time to adjust. If you can, find a place in your new city that reminds you of home. It may be in the natural environment (for instance, by a beach or in a forest), or a coffee shop that smells familiar. Transition is difficult because you have moments of emptiness where you don’t know what to do. Begin to create a routine so your life has some kind of structure. Go to work, find a gym, commit to a community group, go to church, join a sports club or create a social night at home where you relax with housemates or your spouse. Plan these things out in a diary, and you will feel purposeful. Did someone at work invite you out for drinks? Say yes. Did a friend suggest a local restaurant or movie theatre? Say yes. Did an acquaintance add you on Facebook? Say yes. You have nothing to lose in this new season. So short of taking care of yourself, don’t be afraid to say yes to new people and opportunities that come your way. You never know what will come out of them. Have you moved away from home? Would you like to explore strategies and techniques to help you through this transition? Here’s what you need to do: contact Colleen on 0434 337 245 or Duncan on 0434 331 243 for a FREE 10-minute phone consultation on how we can best help you, or press book now to book on our online diary.